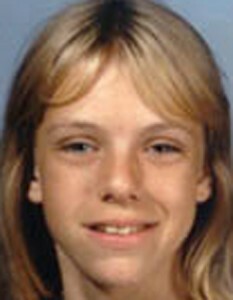 Martha Jean Lambert has been missing since November 27, 1985. Martha Jean Lambert was just 12 years old when she went missing in St. Augustine, Florida. It was thought that Lambert was kidnapped and murdered; however, she was never located. Her disappearance remained an unsolved mystery until today. FLASH FORWARD 24 YEARS … the case has now been solved according to the St. Johns County Sheriff’s Office. The case has finally been closed. The brother of missing Martha Jean Lambert, David Lambert, has confessed to accidentally killing his sister during an argument. David Lambert would have been 15 years old at the time. However, the St. Johns County Sheriff’s Office said Friday that Pichon’s son David Lambert has confessed to accidentally killing his sister in an argument. Sgt. Chuck Mulligan said Lambert told police that he panicked and buried the girl in a shallow grave. Lambert was 15 at the time. The State Attorney’s Office decided not charge Lambert with manslaughter after prosecutors considered his age at the time, the statute of limitations manslaughter charges had in 1985 and “other mitigating circumstances,” Mulligan said. When Tice and Cole interviewed him again last summer, Lambert told them he and Martha Jean were arguing near the old Florida Memorial College site over $20 he refused to give her, the detectives said. The girl punched him in the face, and Lambert said he shoved her backward. Her head landed on a piece of metal sticking out of the ground, he told the detectives. Lambert told the detectives that he dug a hole 3 feet deep and laid Martha Jean in it. David Lambert lead investigators with extensive excavations and K-9 searches failed to turn up Martha’s remains. Daily Commentary – Tuesday, August 2, 2011 – DB Cooper Mystery Solved? This is crazy. The police in this community need to be forced to do a proper investigation. There is something wrong when a fifteen year old boy takes his twelve year old sister to an abandoned building. This guy needs a proper interrigation by experts not by a town cop or sheriffs deputy who may not know how to investigate any crime. More than likley, this child was raped by her brother and of course she fought back, then the fabricates the story about the steel rod to cover his worthless rear end. Florida police in my mind are too ignorant or lazy to properly protect the people. Case after case has shown this to be fairly accurate. I agree with Tex GF. The kid is telling a pretty obvious lie, it seems to me. As in all these types of cases, we only have his version of events. Trauma to the skull resulting in cranial fracture and hemorrhage; that is blunt force trauma. This child was murdered. Prosecute. Confession and afraid of his “Momma”. Mr. has psychological issue that appeared in his sociopathic inability to feel empathy for others. The victim had a right to not be abused, to live a life without fear, to pursue dreams, fall in love and hear her babies first breath. Raped of life is a crime. The question arises, at 15 years of age was he able to decern between unconscious or dead. He states that he called for help, panicked and buried her in a shallow grave. Without a conscience, when one hurts another they get help, not drag a beloved little sister to a shallow grave. Manslaughter/Murder in the first degree. It takes time to dig a 3 foot hole. You have to get something to dig with, come back, find a place, dig a 6 foot by 3 foot grave. He had time to think about it. Was that metal thing in the ground that she fell on really the metal shovel thing he had that landed on her head. I walk around and never see metal things sticking out of the ground. That grave was not so shallow, shallow is leaves over, branches, he took time to dig, drag and cover the body. Was she even dead when he buried her? Prosecute this child murder. News reports state that both of these kids as well as others in the family had been abused and in and out of foster homes. The boy has made other confessions with different stories over the years and it was determined that his confessions were not true. The girls body has not been found even though cadaver dogs were taken to the site where she is supposedly buried in a shallow grave. placed up for adoption either in Canada, Australia or even back in US. Good chance she is alive with a new name and was told years ago that her parents both where killed in an accident. I agree, the brother’s story does not fit. Search the world & I bet she is found. Don’t give up.